Before the day of the convenient match, people lit their fires using the flint and steel. The predecessor of the match, small sticks of pinewood impregnated with sulfur, were invented in China in AD 577. The modern match as we know it did not come about until the 1800s. Before the match was invented, flint and steel was a common method of fire starting. Flint (or flint-stone) is a hard, sedimentary cryptocrystalline form of the mineral quartz, categorized as a variety of chert. It occurs chiefly as nodules and masses in sedimentary rocks, such as chalks and limestones. Inside the nodule, flint is usually dark grey, black, green, white, or brown in color, and often has a glassy or waxy appearance. Flint has been used to manufacture cutting tools and also to produce sparks for fire. The hard edge of the flint rock was struck against either iron pyrite rocks or high carbon steel. 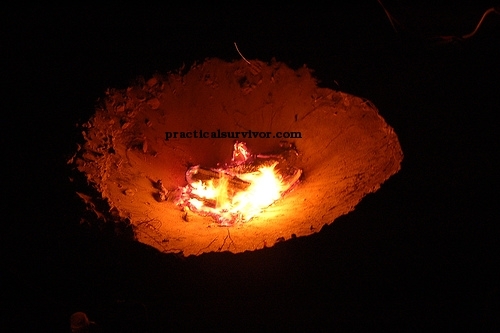 With some practice, this fire starting method would produce a flame faster than some of the primitive methods of fire (hand drill, bow drill, fire plough). Flint and steel is sometimes confused with the use of Ferrocerium. Ferrocerium is a man made metallic material which burns at a much higher temperature than flint rock and steel. It seems people confuse magnesium blocks, with Ferrocerium as well. While we have been able to successfully ignite things such as dry grass with the use of Ferrocerium, only certain types of prepared tinder will ignite with flint rock. The question is, how do we make fire out of steel while using flint rock? Ignition temperature of a material is the minimum temperature needed to cause a substance to burn. Ignition temperature is controlled by properties such as density, surface area, and humidity. The striking process increases the steel's surface area and lowers the density of the steel. The increase in oxidation from the small pieces of steel will readily ignite when it comes in contact with oxygen. We can then capture the hot shavings onto proper tinder and blow it into a flame. The flint edge must be shard and we must strike by coming down the edge of the flint at a right degree angle. We will cover this in more detail. So lets discuss several methods to make one of our best friends in the woods, FIRE. Randall's Adventure & Training now makes an ESEE ESFIRESTEEL made of 1095 Carbon Steel. It has a bow drill divot. The tinder tube and tinder fungus are two types of tinder that readily catch a spark from the flint and steel method. Now that we have our materials together, we have to create a spark that will hopefully land on our tinder. There are two common methods to do this. The first is to place the tinder on top of the flint rock and firmly grasp both with one hand while striking the steel with the other. (Strike with the c-shaped steel. We will call this method A). The second method (B), the tinder is placed below the flint rock and the spark is sent down towards the tinder. This method is more common when using the back of a high carbon blade to create a shower of sparks towards the tinder below. Iron pyrite rock can be used in the same manner. Once the spark lands on the Char cloth we see a red ring that begins to expand. If we blow on the cloth, the ring will get larger and the temperature increases. We place the charred cloth on the tinder nest. Wrapping the tinder around the cloth as we continue to blow on it. The tinder will dry and ignition temperature is achieved. We used dry grass and dandelion clock for the nest. The tinder can be shredded between the palm of our hands or hammered with a stick to increase the surface area of the tinder. The thinner strands are more likely to ignite. The skill of taking a coal from a small source of heat into a flame is critical. We are talking about transferring your newly created spark, onto the tinder, the tinder slowly turns into a coal which we will then blow the bundle into life (fire). This process is used on every form of primitive fire starting method and also aids in igniting a fire from left over coals. Most fire starting methods such as bow and drill, fire plow, and flint/steel will require bringing a coal to fire. This skill can be practiced by making char cloth, lighting it with firesteel, and transferring the cloth to a tinder bundle.